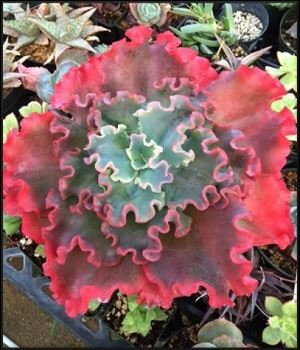 Join us (and Cactus and Succulent Society) at the garden of Christine Vargas in Central Alpine. 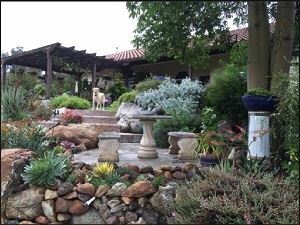 The garden is a one acre mix of fruit trees, ornamental trees, drought tolerant shrubs, salvias, sages, proteas, and yes - LOTS of cacti and succulents! The home was built in 1997 so it is a well-established garden that is gradually becoming more water-wise. A new addition to the garden is a front yard that formerly was grass (food for the millions of bunnies!) - now it's succulents and rock! Alpine tends to get extreme heat in summer and extreme cold in winter (sometimes 20 degrees F!). So it has been a challenge to find just the right placement for succulents! Propagated plants from the garden will be for sale. An extra-added treat for the gathering will be a visit by Mr. Brent Weigand from Wildomar! He is an avid hybridizer of succulents and will be discussing (at 11 AM) some of his methods and techniques. He will also bring some of his fabulous plants to sell!